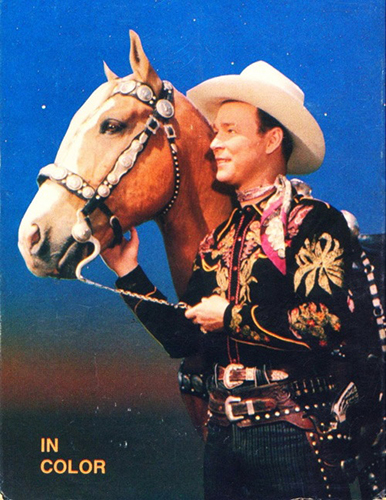 By the time Larry Weiss’s song “Rhinestone Cowboy” became a hit for Glen Campbell in the mid-1970s, the image of the country music star dressed in a glittery rhinestone-bejeweled suit had long been fixed in the popular imagination. At that point in the genre’s history, though, most singers were eschewing that sort of sartorial statement. 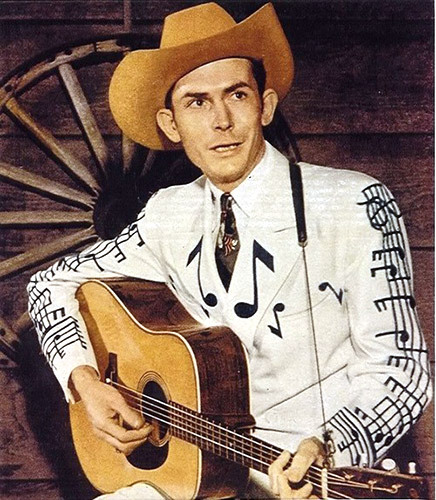 The flashy style once favored by legends like Hank Williams and Roy Rogers didn’t fit with the outlaw persona cultivated by the likes of Willie Nelson and Waylon Jennings. But a few stars dug the old look. 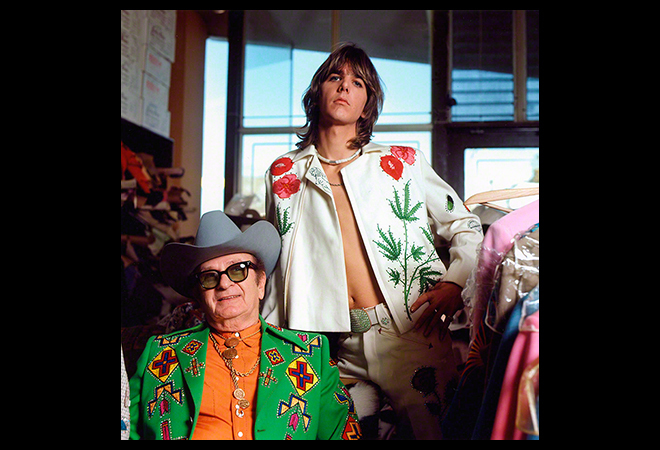 Gram Parsons was one of only a handful of country musicians who successfully crossed over into rock and roll, as both a member of the Byrds and a musically influential friend to the Rolling Stones. His own country rock band of the late ‘60s and early ‘70s, the Flying Burrito Brothers, has a strong cult following to this day. For the cover photo on the group’s debut album, The Gilded Palace of Sin, Parsons commissioned an outfit made by none other than Nudie Cohn, the tailor who had given all those cowboys their rhinestones back in the 1950s and early ’60s. Celebrity music photographer Raeanne Rubenstein’s picture of Parsons and Cohn, shot in the tailor’s Los Angeles shop was a highlight of the exhibition Country: Portrait of an American Sound at the Annnenberg Space for Photography. The show featured work by ten prominent photographers, covering a wide swath of thematic territory. Henry Horenstein conveyed the low-down, good-time atmosphere of now largely vanished honky-tonks and dance bars. Les Leverett, house photographer at the Grand Ole Opry for more than thirty years, captured countless legendary acts performing at the mecca of country music. Los Angeles Times staffer Leigh Wiener helped define the public identity of Johnny Cash, just as Michael Wilson later did for Lyle Lovett. Henry Diltz chronicled the California scene. The model that Cohn sewed for Parsons was unlike any other. Visible inside one lapel is the embroidered figure of a voluptuous naked woman. The green leaves featured prominently in the design on the front of the jacket are a marijuana plant, and the red-petaled flowers above them are poppies, the natural source of morphine, opium, and heroin. Five years after this picture was taken, Parsons—who had dropped out of Harvard after one semester to pursue his musical dreams—died of a morphine overdose at the age of 26.